That simple vegetables could be transformed into such a delectable flavor shows the power of artful use of spices. Once you have gathered the spices, this dish is very inexpensive to make again and again, yet so rich in flavor your family will be requesting it often! 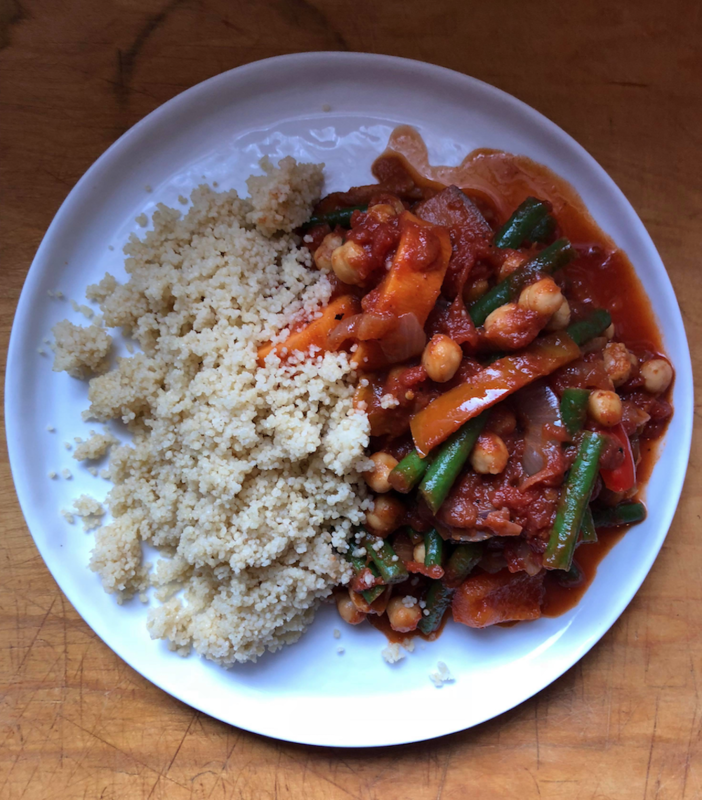 If you choose not to add chicken, the couscous (a grain) combined with the beans create a complete protein, the equivalent of meat. So give it a try and watch your family really learn to love their veggies! (Child) PEEL the sweet potato or yam. (Adult) CUBE the potato, and place in small saucepan. COVER with water and COOK on medium heat until just tender. (Adult) PEEL and SLICE the onion. (Child) Using a table or plastic knife, help CHOP the onion slices, slicing first in one direction, turning, and slicing again in the other direction. (Adult) HEAT the olive oil in the large pot, ADD the chopped onions and reduce heat. COOK for 5-10 minutes, until softened. (Child) TRIM the green beans. SLICE the beans into bite-sized pieces with table knife. (Adult) SLICE the carrots and zucchini. BLANCHE carrot slices with green beans in the pot with the potatoes. (Child) MEASURE the spices. ADD to the onion in the pot. ADD the tomatoes, squeezing by hand to break them into bite-sized pieces, adding the remaining liquid at the end. ADD the peas or snap peas and zucchini slices. COOK 10 more minutes. (Adult) DRAIN the boiled vegetables, and add to the pot mixture. ADD raisins (if using) and chick peas. ADD chicken if using. COOK 5 more minutes or until everything is evenly heated. (Adult) SEASON to taste with salt and pepper. Serve over cooked and fluffed couscous. (Adult) While the vegetables are cooking, HEAT3 cups of water in a medium saucepan with a lid. Let the water boil. (Adult) When the water has boiled, ADD the couscous, STIR once and COVER the pot with the lid and turn off the heat. Let set 10 minutes. (Adult) When you are ready to serve, UNCOVER the couscous, fluff with a wooden spoon and serve with the vegetable sauce over the couscous. Fall/Winter Diced and blanched winter squash (pumpkin, butternut or acorn squash); turnips; rutabaga. Spring Asparagus, peas; fresh cranberry beans or fava beans; ramps or garlic scape. Summer Summer squash; golden or striped beets; turnips or corn sliced off he cob.